7-Eleven Malaysia is proud to launch its first ever – The Slurpee Siku Challenge! 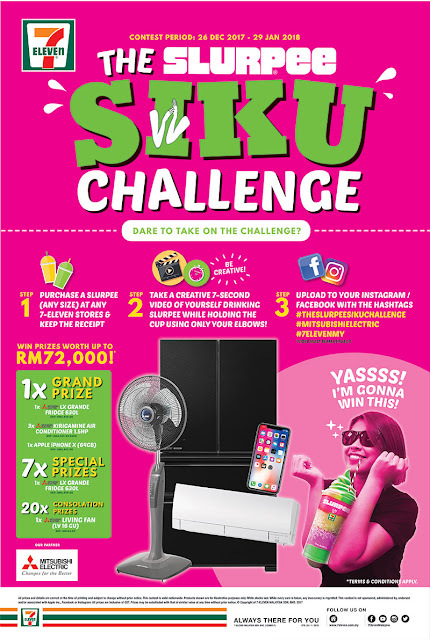 Take this opportunity to round up your friends and family to join this hilarious yet fun challenge. A qualified participant must purchase a Slurpee (any size) at any 7-Eleven stores and keep the receipt. Take a creative 7-second video of yourself drinking Slurpee while holding the cup using only your elbows. Think you’ve got what it takes to complete this challenge? We dare you to join now! *Instagram/ Facebook must be public.